Over 90% efficiency at full load. 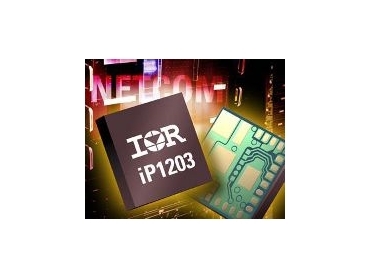 INTERNATIONAL Rectifier , has released the iPOWIR iP1203, a 15A single-output synchronous buck converter that achieves over 90% efficiency at full load. It addresses requirements from 5.5Vin to 13.2Vin and 0.8Vout to 8Vout, maintaining a full load capability of 15A. It simplifies dc-dc point-of-load (POL) converters for network processor units (NPUs) and ASIC power rails within networking and telecommunication systems. It is suitable for use in two-stage distributed power architectures being fed from either a regulated isolated brick or an unregulated dc bus converter. It integrates a full-function PWM control IC, trench MOSFETs and passive components enabling excellent thermal performance at raised ambient temperature without de-rating. It also incorporates the most critical sync buck power functions so that designers do not have to worry about component selection or board layout. It addresses important networking and telecommunications power system requirements such as hiccup over-current, over-temperature and over-voltage protection, external synchronisation, power good and soft start. The building block is housed in a land grid array (LGA) package measuring 9mm x 9mm x 2.3mm. The iP1203 uses thermally-enhanced mould compound, enabling dual-sided cooling and very low junction-to-case and junction-to-PCB thermal resistance for maximum current handling.